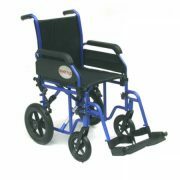 Foldable outdoor wheelchair ( for transit) with painted steel frame, equipped with 2 full front wheels of 200 mm and 2 full rear wheels of 300mm. 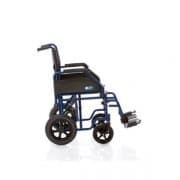 Double steel stabilizating frame, black nylon seat and back, and washable, backpack pocket.Rear wheels (Ø 30 cm) with quick release, black PU tires, small safety wheels. Double hole on the frame for modification of a self-propelled wheelchair (optional kit). 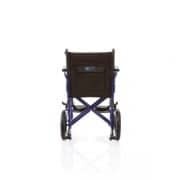 PVC front wheels with steel fork.Foldable short armrests with black nylon padding. Detachable adjustable footrests in length with black plastic footboard and heel strap.